OTTAWA - Stephen Harper castigated Canadians who refuse to vaccinate their kids as he announced $22.5 million in additional funding for inoculation programs in some of the world's poorest countries. 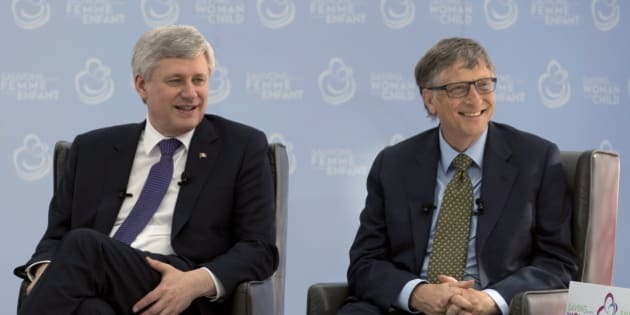 The prime minister announced the new funding — $20 million to strengthen immunity to polio and up to $2.5 million over two years to help eradicate maternal and neonatal tetanus — during an event Wednesday with billionaire philanthropist Bill Gates. The irony of Canada investing millions to prevent death and disease in poor countries while some of its own citizens balk at vaccinations was just too stark for him to ignore. "My wife would kill me if I didn't say this because she is really, really exercised about this," Harper told foreign aid groups during a moderated discussion with Gates. "We in the educated, advanced, medically advanced, sophisticated part of the world, we have a responsibility when it comes to this, not just a responsibility to vaccinate our children which I think every parent has a responsibility to do, and not just a responsibility to encourage that widespread vaccination so we're not putting other kids at risk. "But we have a responsibility to set an example, for God's sake. We know these medical interventions work and as an advanced, educated society it is completely irresponsible of people in this society to communicate anything other than that anywhere else in the world." For parents who may still worry about the purported health risks of vaccinations, Harper had blunt advice: "Get the facts from the medical and scientific community and if you're not a doctor or a scientist yourself, listen to the people who are. It's that simple." Harper and Gates urged the world to keep the issue of maternal, newborn and child health as a development priority. It's a cause Harper has championed for years alongside the American computer pioneer and the Bill and Melinda Gates Foundation. In June 2010, Harper persuaded world leaders at the G8 Summit in Muskoka to focus on maternal and child health and has contributed billions to the cause. Gate called the Muskoka summit in central Ontario a "milestone" that helped focus foreign aid funding on specific goals. "I want to thank the prime minister for his leadership on this. The clarity really has been fantastic," Gates said. While progress has been made, he said much more needs to be done. "So, here we are in 2015, childhood deaths are half of what they are in 1990 ... We want to cut it in half again." — $20 million to support the World Health Organization campaign to strengthen long-term immunity against polio in Cote d'Ivoire, Honduras, Malawi and Tanzania. — Up to $2.5 million over two years to match the contributions of UNICEF Canada and the Kiwanis Foundation of Canada for a campaign to eliminate maternal and neonatal tetanus in Chad, Kenya, Pakistan, South Sudan and Sudan. Harper also announced up to $20 million over five years to support research into improving the delivery of health care for mothers, newborns and children in 13 sub-Saharan African countries.